What are the best camper generators in 2019? 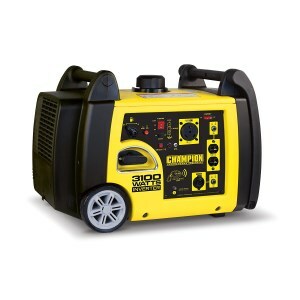 If you’re looking for a good camper generator but don’t have the time to read through this whole material, then we’ll tell you first-off that our top pick is the Champion 75537i. Somewhat unusual for an item its size, this small, portable camper generator has an inverter, which will assure a steady supply of AC current with no power surges, so that your sensitive electronics can be safely plugged in. Besides the regular 120 V, 30 A outlet that’s specifically intended for RV use, the Champion can also connect to your household electrical appliances by two 120 V, 20 A outlets. To top it off, an included adapter can deliver 12 V of DC current for recharging batteries or jump-start a car. If you’re not interested in an inverter, then the Champion 76533 offers its own set of very attractive features. The product includes a wireless remote start, with a range of up to 80 feet. It is RV-ready with a 120 V and 30 A outlet. A USB adapter for 12V DC is included. It is very quiet and comes with a 3-year warranty. On cool mornings, the remote start function might not work, requiring manual choking. Sometimes, its wheels might come apart easily, as well as other not-so-important pieces. This power generator is more than enough for the everyday needs of campers and boat owners. It is efficient, quiet, and versatile. The remote start function is not reliable. The generator can use gasoline and propane to operate, making it highly versatile. It has a high output power and a reliable 224 cc engine with push-button electric start. It is very reliable. The starter can break down after only one or two uses, especially if dropped during delivery. Customer service is not efficient, and sometimes troubleshooting takes time. 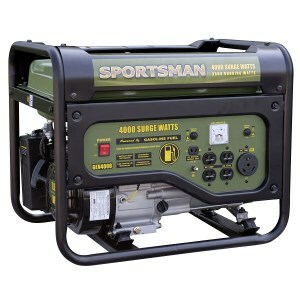 Powerful and quite economical, the generator has good value for the money. If handled properly, it should work fine, even on colder days. It has more than enough power for the needs of an RV. 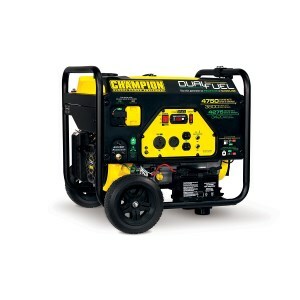 With a rating of 4000 watts, this gasoline-powered generator has 4 120 volt outlets and 1 12 volt outlet. It has low fuel consumption, running for 10 hours on a full tank. It is pretty quiet, at 69 dB. The surge voltage could prove problematic, and it does not remain constant throughout use. Adding too much load on it could lead it to malfunction or work inefficiently. With a lot of power outlets, the product is versatile, and if properly used, there should be no problems operating it. It should not be used to fuel large consumers who draw much power. Before setting out to find the best trailer generator for sale, there are a couple of things we should be aware of in order to ensure the best purchase. The best generator for RV won’t necessarily deliver the highest amount of power (after all, it’s not a sports car) but it should provide enough electricity to cover the electrical appliances you commonly use. Both the generator’s output and the energy your appliances require to run is conveniently measured in Watts, so it’s very easy to make a calculation of the wattage you need by adding up all the consumers. The most basic RV setup will feature an 80 liter fridge, which usually runs at 55 W; two 30-watt lights; one radio or TV for 200 W; a 1300 W air conditioner; and a phone charger of around 5 W. This adds up to 1600 W, which might double for RVers who like their luxury away from home. It’s good to have some leeway, but going a lot higher than what’s required will leave the generator burning expensive gasoline for no reason. Some newer models do have economic modes, which lets them operate at reduced capacity, and should definitely be something to look into if you don’t expect a consistent energy usage. An electric start means that you won’t have to spend minutes of your time cranking a cable to get the engine running, and most units that feature this also have a traditional back-up. There’s little reason not to opt for it, especially as it doesn’t add a lot to the price. In the US, a typical generator will run on gasoline, but there are other options of fuel available, such as propane or natural gas. Besides being slightly cheaper, propane also has a higher shelf-life than gasoline, so it can be stored for emergencies. A low-oil shut-off means that the generator won’t be running on dry, which can seriously cut its lifespan, not to mention smoke the entire campsite. The best camper generator is a silent camper generator! Even if the machine is supposed to be kept at a minimum of 23 feet from you while running, that doesn’t mean it can’t prove bothersome in a trailer park or when trying to enjoy nature. If you don’t like dragging heavy loads around, then size and weight will become an issue. All good units are fitted with roll cages to grab them by and wheels to roll, but you won’t always be able to find a smooth surface for the latter. This one gets top scores in camper generator reviews because of its remarkable array of features, which seem to include everything currently available on the market. Somewhat unusual of a unit its size, it has an electrical inverter, which allows it to deliver steady current, with less than 3% THD (total harmonic distortion). This basically means it won’t fry any electronics attached to it through surges in current. To take full advantage of this fact, 2 of its outlets deliver 120 V 20 A regular household current, with a third being used for the 30 A common with campers and an extra 12 V DC charger plug to top it off. The 2800 W running power should cover most uses, and on a slow day, this can be reduced to provide more fuel economy and allow for a longer functioning time. You might sometimes be confused on whether it is running or not, as it only puts out 58 dBA of noise at 23 feet. The 76533 might not have an inverter, and it’s also somewhat noisier than the other Champion we’ve looked at, but makes up for it with some extra versatility, as it can run on both gasoline and propane. And it does this for quite a long time, 9 hours for a full tank of gas and 10.5 hours for a regular canister of propane at 50% installation load. The power generated while running is between 3800 and 3420 Watts, depending on the fuel, which will be more than enough to keep a washing machine on. All this energy will be delivered through 4 outlets, of either 20 A or 30 A, two of each, so that the wires connected to it can share the load. Like with all newer models, the starter is electric, and it’s doubled by a crank string just in case the battery it comes with runs dry, and you lack a replacement. This Sportsman GEN4000 has almost all the features you’d expect from a top of the range model, but it comes at a significantly lower price. It produces 3500 running Watts with a 212 cc gas engine that can be kept running at 50% capacity for up to 10 hours. While we do recommend you always keep an eye on the oil gage, this item will prove forgiving to any mishaps since it has a low-oil shut-off feature, which turns it off whenever the level drops under certain limits. It has four household outlets to share the load, a dedicated 120 V 30 A outlet for an RV and a 12 V battery charger. The front panel also contains an electrical start-up button and a voltmeter. While relatively light and easy to pick up by two side-handles, the GEN4000 doesn’t come with its own wheels, and you might want to add a couple of dozen dollars to the price for purchasing some.